My sewing machine became inoperable a few weeks ago. I had been sewing a project and the bobbin became tangled with the material. It was quite severe, and being the inpatient soul that I am…the bobbin casing was pulled up when I tried to untangle the thread. Hubby tried to fix it and watched a few videos and read pdf files, but the thing just wouldn’t work. We opted not to take it in and have someone charge us 68.00 just to look at it. We didn’t pay that much for it – so did research for a new one. Are machines that replaceable now? Or can you just not fine a little old man that repairs machines? 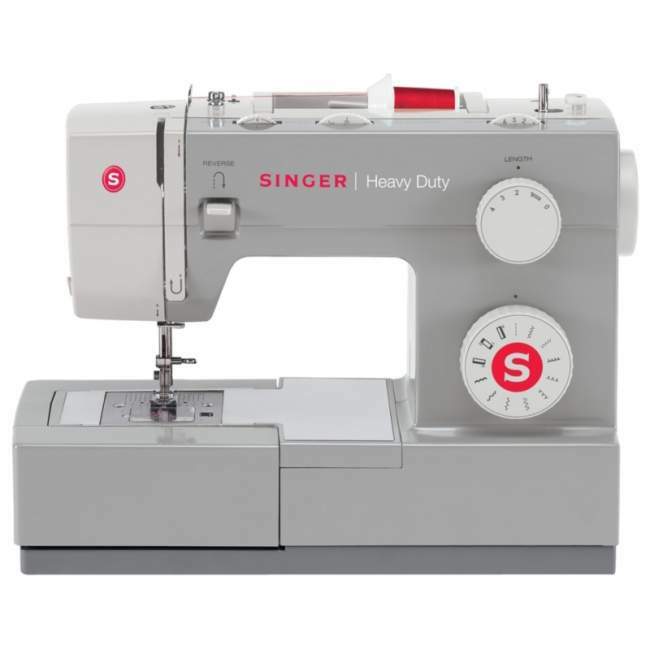 Either way…J’s was having a sale and I came home with a Singer “Heavy Duty” machine. I didn’t need anything fancy schmancy! It sews like butter! I love it…but it scares me that machines may be replaced every few years because a tune up/repair may cost as much as a new machine. Which leads me to this thingamajiggy…. I bought this a few weeks back at Kohl’s…cuz I loved it and thought it was unique. I have no idea what it is supposed to be. It does not have glass. I think ivy in the center might make a nice centerpiece….or??? Got ideas?? Sadly it seems that these days in our ‘throw away’ society it is frequently cheaper to buy a new one than repair it. We are just buying a new freezer and were told the expected lifespan of a freezer today is about 6 years….the one we are replacing is at least 15 years old!!! Your new machine sounds good….let’s hope it lasts a fair few years. Ah, I’ve been eyeballing that exact machine Nancy! I don’t need all the fancy stitches or embroidery either, but I can think of a 1000 times I wish I had a machine that would handle heavy fabrics and thread better. The problem is there is nothing wrong with the machine I have so I hate to pay for a new one. But……..I’d be very interested on your input in several weeks after you’ve put this one thru its paces. I might change my mind about springing for a new one. Yeah, they certainly don’t make things like they used to. Sadly, we have become a disposable society . 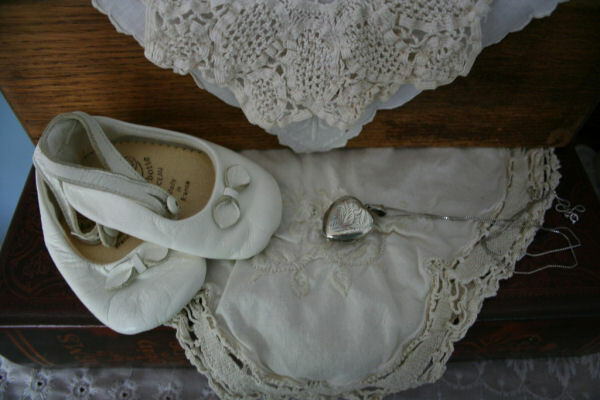 . .
An adorable pair of little shoes here Nancy! My DH says I’m married to my sewing machine – I also have a back up machine because I just can’t live without one and yes heavy duty it must be for the collages and books we create. Good luck with this one Nancy – let us know what you think. Hugs and happy sewing once again! It is sad that what you buy today will not last us. Especially with the rising cost of living-what are people suppose to do? I have a cheapy sewing machine that I know will not last too much longer and hate the thought of having to invest in another one. Your daughter’s shoes are so adorable. And yes, a climbing plant would be very cute in your thingamajiggy. Maybe even a flowering something or other. That would be so cute on a patio (in good weather) with sweet peas climbing up or nastursium or ? I would love to see it when you get it decorated. I think like so many things being made in China and elsewhere so cheaply, with cheaper materials, there just isn’t the life expanctancy we used to take for granted. My Maytag washer/dryer is 17 yrs old, never had needed anything done. Still going strong thank goodness. A repairman (working on our fairly new range that was not working right) said he could not recommend anything appliance anymore… they’re just not being made well. The new Maytags are NOT made at all like my old set. Actually I have two sewing machines and two sergers!!! I inherited my mother’s Bernina, so I passed on my Bernina to my d-i-l. I had intended to trade in my original Bernina, but was quoted so little for it, it was worth more to me to keep it. Same with my first serger, made more sense to buy a second one… keep dark thread on one, white thread on the other!!!! The Euro Pros I bought are good heavy duty machines and have worked well for 12 yrs now. 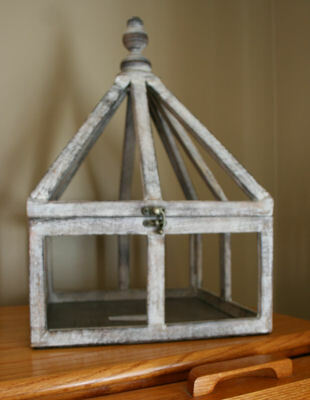 I thought maybe the thingamajigg was a candle holder, since there’s no glass, but it has great potential doesn’t it? I just bought a new machine but wanted bells and whistles. While heavy duty sounds better, I just needed some extra stitches than were on my old Singer that died a couple of years ago. (I got an old machine at a yard sale and have made do with it in the mean time). I paid lots more for my machine that died…lots…but that machine was metal and years old and some fancy stitches, but not many. This new one is so light and made of plastic, but I can buy one every couple of years as compared to my old one which had to last a long time for the price. It has over 100 stitches and an alphabet. Looking forward to that option. And being a little older, I will certainly take much better care of this one. I will be very disappointed should this one not work out for me. The little greenhouse thingie is adorable. Send a pic when you decide what you will do with it. I too agree that it’s a shame we have become such a disposable society. Things aren’t meant to last and then there is more trash in our landfills. Very, very sad! I’ve got an old Singer machine that works fine but only does one stitch so I bought a newer (plastic) one that does a number of them. Then I bought a tiny little Janome that I only use to sew on paper and LOVE it. I also inherited a minature Singer (metal!) from my Mom that she got at a garage sale. It costs a fortune for them to repair it (it only sews a backward stitch…lol) but it’s just so darn cute I can’t part with it. My hubby just laughs at me that I have so many machines!